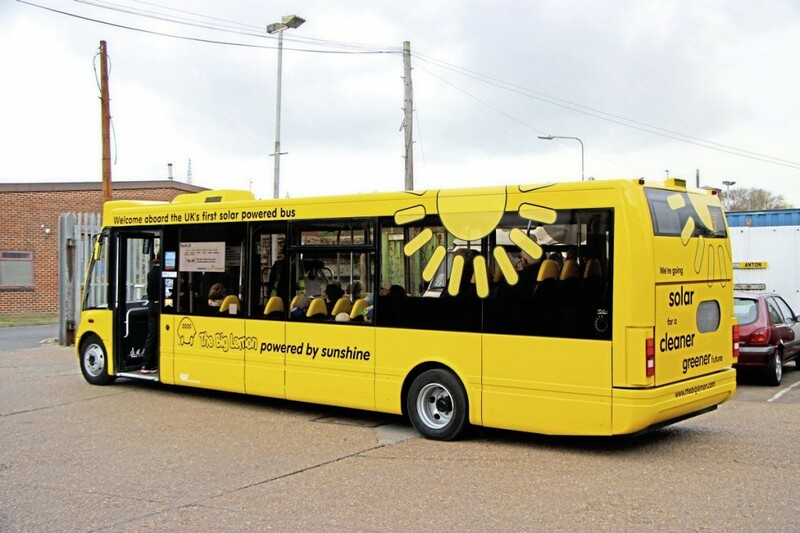 Brighton based community interest company (CIC), The Big Lemon, has placed in service the first of two Optare Solos which are believed the first buses in the UK, and possibly the world, to operate on solar power. The vehicles have drivelines manufactured and built by Magtec in the UK. 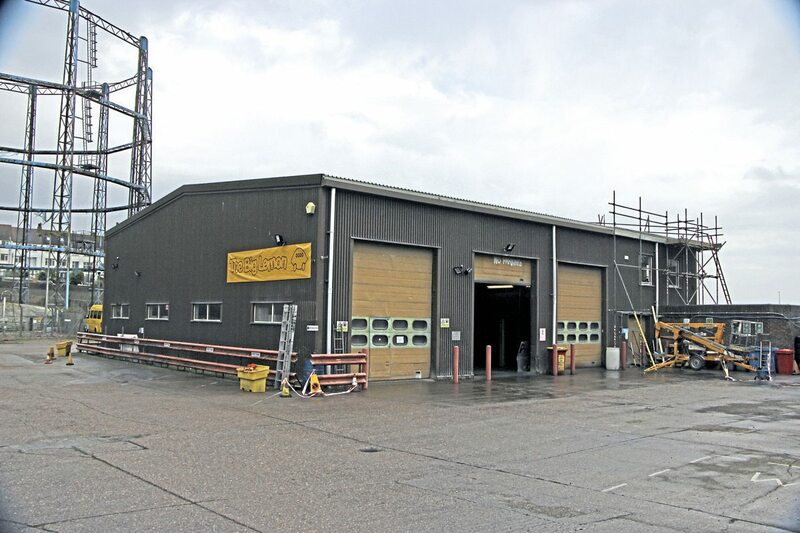 Last Friday the company held a Launch event at its premises in Boundary Road, Whitehawk, to which its many stakeholders and shareholders were invited. The Big Lemon made the headlines recently with the surprise appointment of former Transport Minister, Norman Baker, as its MD and he joined founder, Tom Druitt, in welcoming everybody to an event that had a genuine community feel and something of a carnival atmosphere. Those attending included: local MP, Caroline Lucas, the country’s only Green Party MP; Councillor Pete West, the Mayor of Brighton & Hove Council; Councillor Gill Mitchell, Deputy Leader of the Council and Chair of the Environment, Transport & Sustainability Committee and many of the stakeholders and supporters. Tom Druitt thanked them and a huge list of those who had helped and supported the company. In speeches, Cllr Pete West said to Tom Druitt that ten years ago, ‘there were some of us who thought you were slightly crazy,’ but that Big Lemon showed, ‘where there’s a will there’s a way.’ After the speeches, he unveiled a plaque on the depot wall recognising Big Lemon’s sponsors, after which Oshik Romen of Viper IT Solutions, one of Big Lemon’s supporters, revealed the name of the first solar bus as ‘Om Shanti’ which translates as ‘I am Peace’. Trading since 2007, The Big Lemon relocated to the current site in January 2008 and now operates a mixed fleet of 13 vehicles including seven coaches. It started with three buses and a Sprinter van support vehicle and with the first bus out at 06.30 for a 07.00 start and the last not back until 02.00 it was exhausting for everyone involved. The business model and method of financing differs from most other companies I have encountered. It has 69 shareholders who are members of the local community. 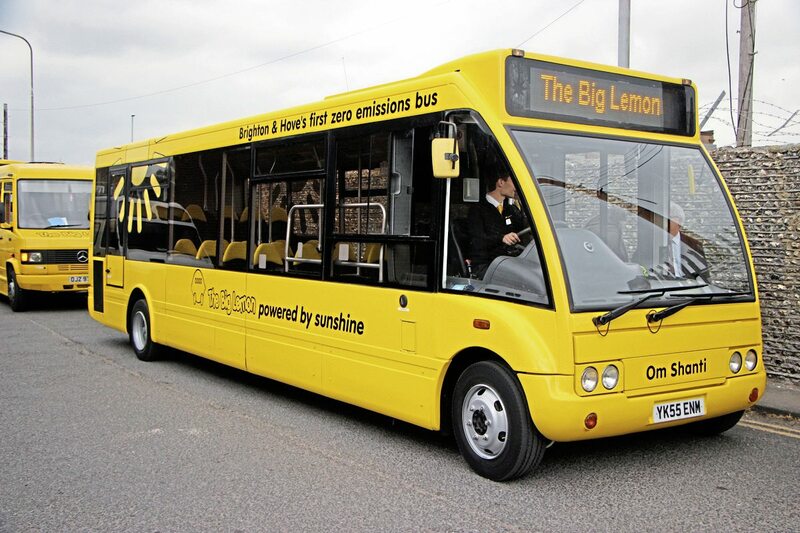 To pay for the solar powered buses, The Big Lemon went for crowd-funding, raising £250,000 through the sale of electric bus bonds to 166 investors. 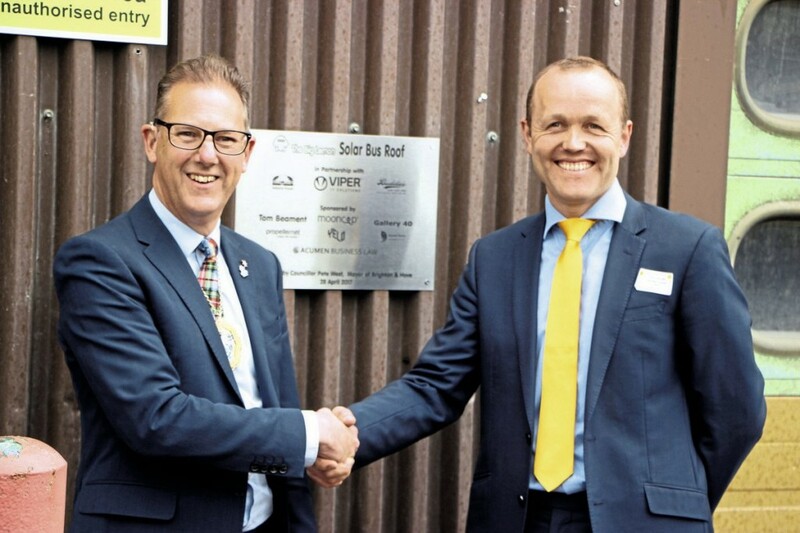 In addition, it was successful in winning the Marks & Spencer Energy award for the Southern region worth £12,000 towards buying the solar energy panels and installing them on the roof of the depot. So far, these panels only cover one third of the roof (which was all that could be afforded initially) but more will be installed as and when they can be. 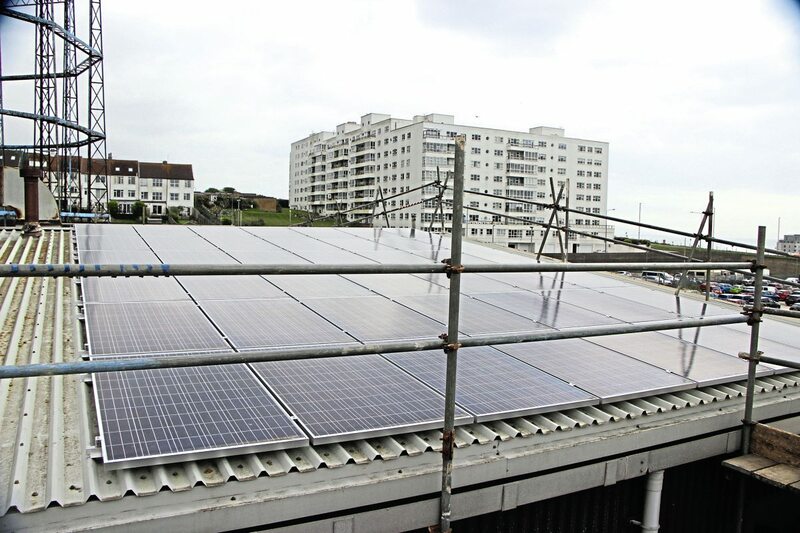 Already, solar panels donated by Crawley Borough Council to the Brighton Energy Cooperative are at the depot and quotations for their installation are awaited. The aim is to keep going until the roof is covered, which would generate sufficient power for three buses and the offices. The way the solar energy project works is that the solar panels mounted on the depot roof generate electricity that is fed into the grid. 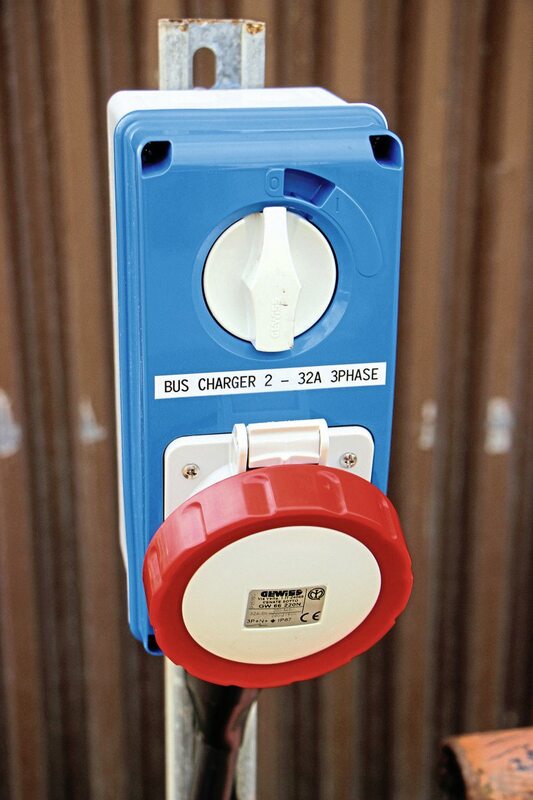 At the end of their duties the buses return to depot and are recharged via two 32amp, three-phase chargers. These operate at 415 volts which is quicker than a 240volt system would be but not as fast as a fast charger would be. Currently the peak capacity of the system is 21kW and on the not particularly bright day we visited the system was generating 18kW. Painted in The Big Lemon’s bright yellow colours but in a new version of the livery designed by Tom and Norman, both of the new buses will be used on the 52 service which links the centre of Brighton with Woodingdean. The company has already been operating the route but with conventional buses pending the arrival of the new duo, the second of which is expected in the coming weeks. Asked whether it wouldn’t make sense to have a fast charger located on the Old Steine were the terminus of the 52 is, Tom said it would. Were it to be topped up there during the service’s 15 minute layover it could operate all day without the need for an off peak top-up which may be required using the present system. 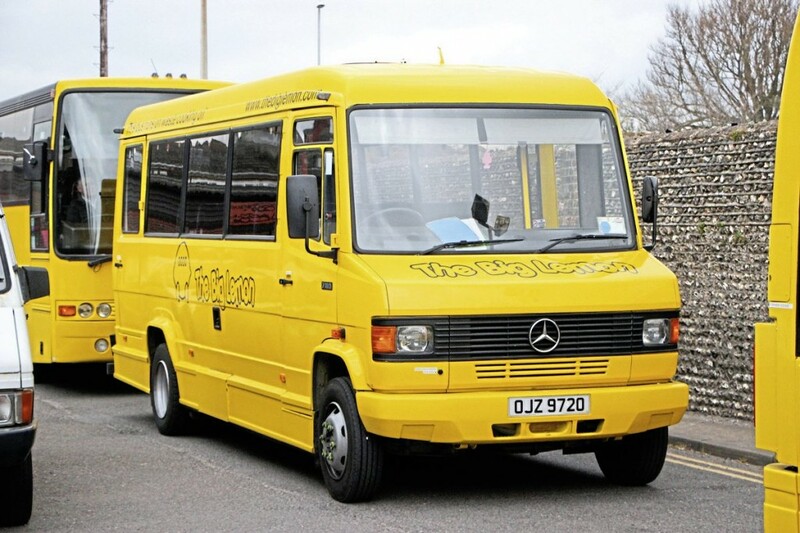 New in February 2006, the base vehicle was new as a diesel powered Optare Solo 920SL model. Originally with First in Leeds, it carried MetroConnect livery and operated the free city centre bus service. 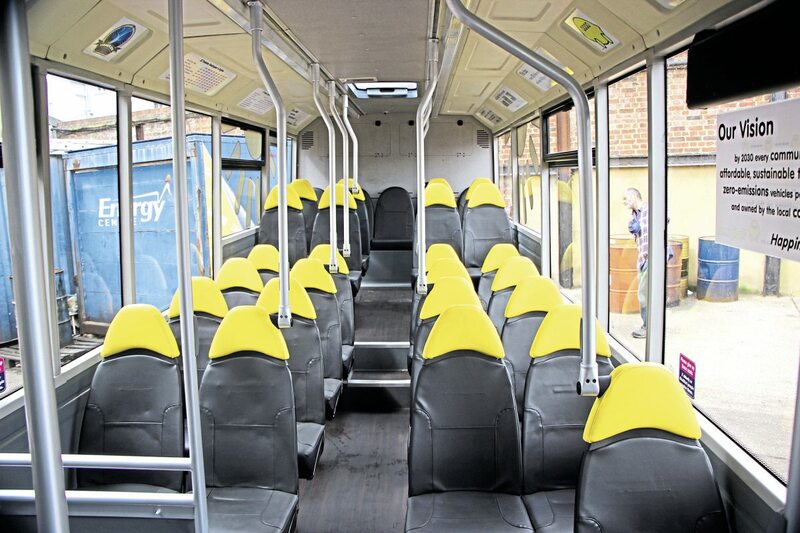 Before delivery to Brighton it was fully refurbished by Thorntons with leather seats, Wifi and USB charging points. It then had the original driveline removed and replaced with an electric one by Magtec of Sheffield at its new Rotherham re-power facility. The new driveline consists of a 120kW continuous power motor designed and manufactured by Magtec in Sheffield. The system converts DC to three-phase AC via a Magtec motor controller that handles the power electronics. This is the brain of the system, controlling not only power to the motor but also the regenerative element. A step down gearbox is fitted which reduces the power from the motor by a third, otherwise the torque generated would snap the shafts. Located at the rear, the batteries are Lithium Iron Phosphate or LPO4 units manufactured in China. Data loggers are fitted enabling all systems to be remotely monitored. Magtec MD, Marcus Jenkins, explained that the system installed was ideal for vehicles of up to 14 tonnes in urban areas. To date Magtec systems have been installed in around 120 Optare products. It also offers a bigger system for double deck applications, one of which powers a Big Bus Company Dennis Condor tri-axle double decker now operating in Washington DC. Conversion costs vary between £95,000 and £160,000 depending on the size of the system and order. The Big Lemon conversions were towards the lower end of this price range. Transdev already has double deckers with a 200kW system operating in York and Marcus confirmed that a further five buses are currently in build for the operator. A ride on the Solo around Brighton showed that though the suspension characteristics are those of a diesel version, the level of noise is massively reduced and the acceleration is very sprightly. It is relatively smooth though you can feel it retarding on the descent of steep hills and there is a slight whine from the motor. In the cab there is a pretty conventional looking set of DNR buttons and a display showing how much charge is left. As well as the 52 service, the UB1 is operated for the University, the City College Shuttle for the City College and two services are provided for Legal & General. In addition, a considerable amount of private hire work is undertaken for a variety of customers. There are services to major music festivals and a summer Sunday ramble excursion programme. Apart from the Optares, most members of the fleet are heavyweight coaches dating from the 1990s or Mercedes-Benz minibuses. Norman Baker confirmed that The Big Lemon had recently joined ALBUM. While Tom Druett remains the CPC holder, Norman will be going through the process of obtaining his own qualification. Around 20 people are employed on either a full time or part time basis. With the exception of the two new electrics, the entire fleet runs, and has always run, on biodiesel made from recycled cooking fat. In the early days of the business, when it ran from a lorry park in Shoreham, the company had a van equipped with a 100 litre tank that acted as the company’s workshop as well as having to make trips every four days to Chichester to fetch supplies of biodiesel from a man who made it in his shed! Today stocks are kept in a secure storage container housing five 1,000 litre tanks. Tom describes it as ‘pretty low tech but handy having our own filling station.’ ID tags on each bus enable fuel usage to be monitored. 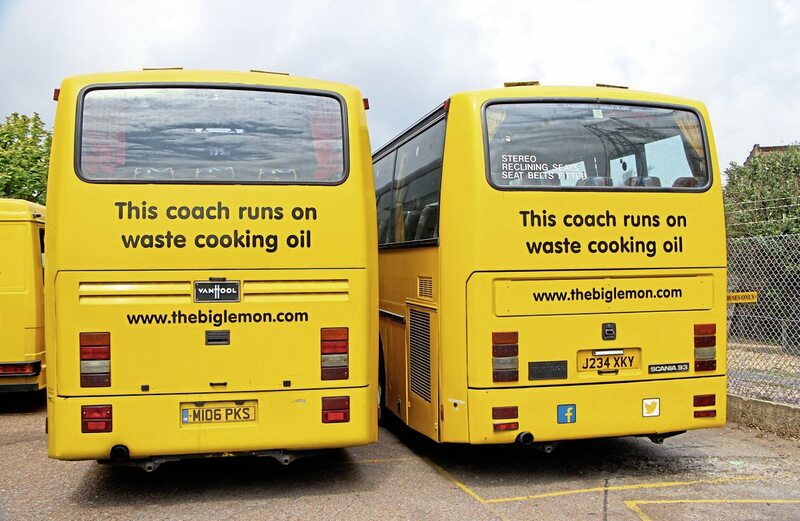 Big Lemon once had a go at making their own biodiesel, producing a 100-litre batch that was used in the minibus and worked though it was never their plan to manufacture their fuel. Two more suppliers followed, the most recent until a couple of months ago, but supplies are now received from Up Town Oils who deliver 2,000 litres every Saturday, with other top ups when required. There are discussions about Up Town establishing a distribution centre on the Boundary Road site. For some years, The Big Lemon operated its own cooking oil supply and waste oil collection business but Tom found that the demands of running it were taking up most of his and his staff’s time distracting them from the main purpose of operating bus services. As a result the operation was sold to another supplier. The benefits of using biodiesel from cooking oil waste are in reduced particulates, roughly half of normal diesel, and no sulphur dioxide. NOx emissions are much the same and so are CO2 tailpipe emissions, although as this represents the release of CO2 absorbed by the rapeseed plants being grown (in East Anglia and the Netherlands), it is sustainable. ‘The main benefit is that, throughout the lifetime of the oil, the carbon footprint is negligible,’ said Tom. Another big benefit is that it prevents the waste oil going down the drains where it is very damaging, forming huge waxy deposits that the water companies have to clean out. Restaurants get paid for the waste which helps and incentivises them. 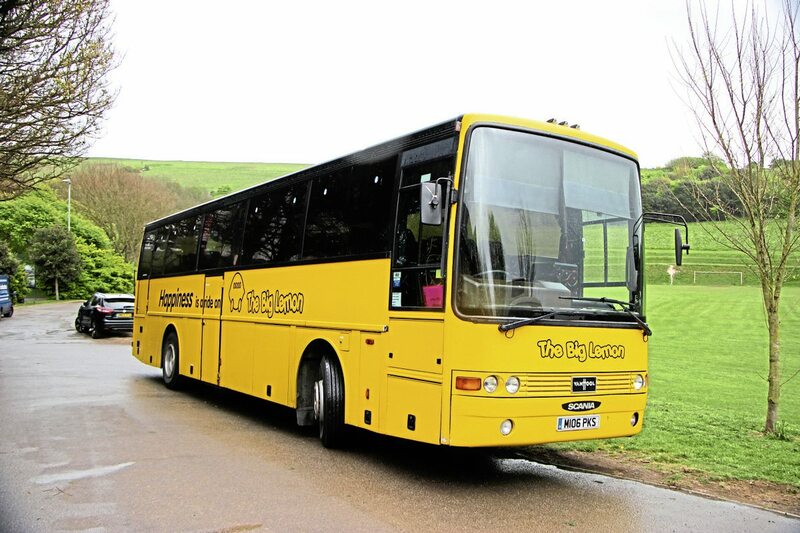 Both buses and coaches in the fleet operate on it and it does not stop the coaches venturing throughout the UK. One was away in North Wales on the day of the launch and they have also travelled to Scotland. The coaches have 400 litre tanks and if more fuel is needed there is a network of other points such as Exeter and Newcastle where stocks can be obtained while on tour. Speaking at the event, Tom Druitt said, ‘We’re delighted to be launching the UK’s first solar-powered electric buses and we are hugely grateful for the support from the local community to enable us to make this happen. Transport accounts for a quarter of this country’s carbon emissions and we see this step as the first in a much wider revolution in sustainable transport nationally.’ He had earlier cited the wish to establish new operations elsewhere as the motivation for appointing a new MD. 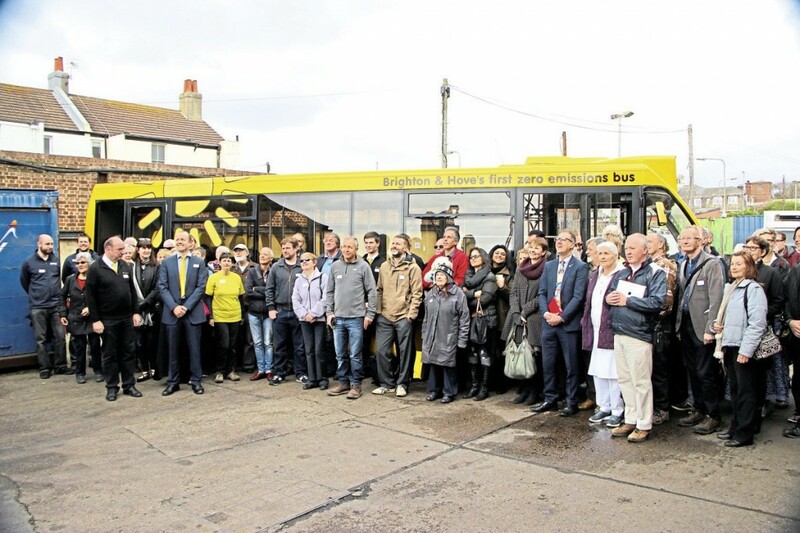 With every bus in it powered with fuels other than diesel and petrol, Tom Druitt reckons the Big Lemon is the cleanest bus fleet in the country. I found it uplifting to see the obvious enthusiasm of so many people for what the company is trying to achieve. Funding electric propulsion infrastructure is expensive and generally beyond the means of small companies so The Big Lemon’s achievement is particularly remarkable and it will be interesting to see how quickly Tom can roll out the concept elsewhere in the country.